On May 13, 2015, United Launch Alliance tweeted this photo of the AFSPC-5 mission payload being mated to its launch vehicle in Cape Canaveral Air Force Station, Florida. The launch, carrying the X-37B space plane, is set for May 20. The United States Air Force's mysterious X-37B space plane will head to orbit this week for the fourth time. 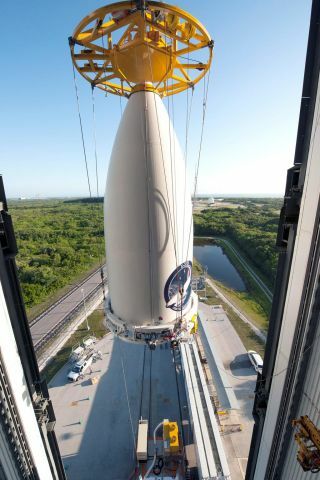 The unmanned X-37B spacecraft is scheduled to launch Wednesday (May 20) at 10:45 a.m. EDT (1445 GMT) atop a United Launch Alliance Atlas V rocket from Florida's Cape Canaveral Air Force Station. The liftoff will begin the reusable space plane's fourth mission, which is known as OTV-4 (short for Orbital Test Vehicle-4). For example, the space plane is carrying a type of ion engine called a Hall thruster on OTV-4, Air Force officials said. This Hall thruster is an advanced version of the one that powered the first three Advanced Extremely High Frequency military communications satellites, the officials added. "A more efficient on-orbit thruster capability is huge," Maj. Gen. Tom Masiello, commander of the Air Force Research Laboratory in Ohio, said in a statement. "Less fuel burn lowers the cost to get up there, plus it enhances spacecraft operational flexibility, survivability and longevity." NASA is also flying an experiment on OTV-4. The agency's Materials Exposure and Technology Innovation in Space (METIS) investigation will see how exposure to the space environment affects nearly 100 different types of materials. The results should aid in the design of future spacecraft, NASA officials said. Artist's concept of the U.S. Air Force's X-37B space plane in orbit. The X-37B looks like a miniature version of NASA's now-retired space shuttle. The robotic, solar-powered space plane is about 29 feet long by 9.5 feet tall (8.8 by 2.9 meters), with a wingspan of 15 feet (4.6 m) and a payload bay the size of a pickup-truck bed. Like the space shuttle, the X-37B launches vertically and lands horizontally, on a runway. The Air Force owns two X-37B vehicles, both of which were built by Boeing's Phantom Works division. These two space planes have flown a total of three missions to date. OTV-1 blasted off in April 2010 and landed that December, staying in orbit for 225 days. OTV-2 launched in March 2011 and came down in June 2012, after a 469-day mission. OTV-3 stayed aloft for a record-breaking 675 days, launching in December 2012 and finally landing in October 2014. It's not clear how long OTV-4 will last. The X-37B isn't the only vehicle launching to space aboard the Atlas V on Wednesday. The rocket will also loft LightSail, a tiny "cubesat" built by the nonprofit Planetary Society that aims to test out solar sailing technologies. LightSail won't actually use its sail for propulsion on this mission, but the data gathered will help pave the way for a sailing-demonstration flight next year, Planetary Society representatives have said.